You can bake In Microwave Convection or Microwave Oven. Convection mode is required for baking cake, cookies and Pizza. Simple Microwave cannot bake. How to bake in microwave is a common question these days when you have the various additional features, that come baked with a single device especially in India. Microwave baking concept was popularized by devices that have the convection mode. If your device does not have this mode, baking in microwave is not possible. Baking in Oven is pretty much same as Microwave Convection. In-fact, new age devices these days even have a combi mode of Convection + Micro that helps bake even faster than standard Ovens. Microwave Oven is a standard term and the device may or may not be capable of baking, specifically. We are answering all the basic questions related to baking (like cookies, Pizza and cake) with your Microwave device here. If you still feel some are left, you can certainly ping us in the comment section. Q. What is the difference between Microwave and Microwave-Oven (Microwave with Convection mode)? A. Microwave is a basic gadget that is primarily used for heating. It throws micro-waves horizontally which helps heat up the stuff pretty quickly. Microwave Oven on the other hand is an extension of basic Microwave. The extension means that it has additional capability to do the Oven tasks as well. The heating system of a ‘Microwave+Oven’ is a bit more complex and throws heat from all sides and hence helps in baking process. The convection mode is the term which is used by manufacturers to market Microwaves which can also do baking. Convection microwaves offer the quick cooking features of a microwave with the browning, crisping, and full “cook-through” of a traditional oven. Instead of just heating the inside of the food (as regular microwaves do), a convection microwave also browns and cooks the outside of your food. Scientifically speaking, regular microwaves emit waves that bounce around until they come in contact with food, causing water molecules to excite and generate heat, which then cooks the food. In contrast, convection oven technology uses a fan to force air movement and heat up the full interior of the microwave to cook food from the inside out. That’s why you can use convection microwaves to bake and roast things that would otherwise be cooked too quickly (and not thoroughly) with just a regular microwave. In some countries like USA and UAE, Microwave Oven is NOT marketed as the one capable of BAKING. Please make sure that the device’s details do mark it as having ‘CONVECTION‘ mode (in addition to Microwave Oven), if you want to bake cakes, cookies and Pizza. If the Microwave Oven does NOT have ‘Convection’ mode, it is NOT capable of baking. Q. Can we bake in simple basic Microwave? A. The simple answer is No. Some of the basic microwaves might help you baking and some people might contest this as well if they have done baking with them. But, technically, they are not made for baking and you might not be able to achieve the same level of results as you might achieve with Microwave+Oven. Simple microwave can help you cook the cake but would not be able to give the brown crust. If you are okay with sacrificing the brown and crispy crust, you can actually use Microwave for baking as a hack. So, we advice you to either use Microwave with convection or Oven. Did you know that you can even bake in pressure cooker? Q. Should we buy a standalone oven or Microwave Oven or basic Microwave? A. The decision entirely depends on the final purpose. Microwave with convection mode is the best value for money if you want to do ‘ek teer se do nishaane‘ (solve two purpose with one arrow). 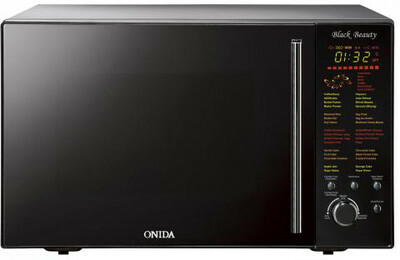 We also did the same and bought the Onida microwave with convection mode. If you do not plan to do any baking, I would recommend to buy ONLY Microwave as it will cost you much less than the microwave with convection mode. Q. If baking in a microwave convection, what temperature and time should be used? And in what mode? A. The temperature and time settings should be same as you would use in the standard Oven. The recipe should be same. Q. If baking in a microwave convection, what mode should be used? Only convection or Micro+Convection combo? A. Both modes (simple convection or micro + convection) serve the same purpose. The difference is that micro+convection mode runs on micro mode for some time and convection mode for the rest of the time. This is done to bake the food item on varying levels of heat at different point of time. For example, if you set total time as 30 minutes, the device will run on micro mode for 30% of the time and rest 70% of time on Convection. This percentage division depends entirely on your particular device and model. Check device manual for more information. The device manufacturing companies argue that the micro+convection mode cooks or bakes the food faster than simple convection mode. We have not verified this claim but it seems logical. Q. Are Borosil (a Utensil brand in India) glass utensils good for baking? A. As per our own experience, we have NOT found Borosil glass utensils good for baking. They are too thick and we have seen that the cake or any other stuff that you bake does not bake well from the bottom portion. Basically, the portion which is hidden deep inside the utensil would not bake well. It is advisable to use other bake-ware made with aluminium or steel with thin skin. This helps in baking the stuff evenly on all sides. Q. What kind of utensils can be used for baking and simple heating in microwave? A. We use the standard microwave safe utensils for heating and oven safe ones for baking. Normally, it is written on the utensil itself about its safe usage. The above image shows the ones that we have used in our recipes specifically for baking. You can find them on Flipkart (India), Bed Bath & Beyond (USA) and Amazon.com too. The ones we have in our videos were bought from Future Bazaar (also known as Big Bazaar) and the brand was Dreamline (in India). The ones you see in our new videos (you can make it out from the new kitchen), the utensils were bought from Bed Bath and Beyond. Q. What is pre-heating and how can we do it in microwave oven or plain oven? A. Pre-heating is nothing but a process of getting the equipment ready before baking. This is same as you would heat up the griddle before cooking chapati or heat up oil before frying. These days, almost all new microwave ovens or plain ovens have the automated option of pre-heating where you just need to select the temperature and start the pre-heating. If you do not have this option or want to do it manually, then just select the temperature as per your recipe and start the equipment with nothing in it for the specified time. For e.g. a recipe might ask you to pre-heat oven for 2 minutes on 400 F.
Q. Is there any difference in the taste of the food cooked in Microwave Convection vis-a-vis food cooked in Oven? A. We have used both Microwave Convection and an Oven to bake our cakes. They are almost same. Standalone Oven is definitely better but microwave convection is nothing less too. What this means is that you can very well use Microwave Convection to bake with no worries about the quality of baking. We have not found any considerable difference. Here is the Veggie Pizza that we baked using Microwave Convection. As a matter of fact, we have used pressure cooker to bake cakes with same level of quality as any other Over or Microwave-Oven! You can check out on your own the Molten Lava Cake in Cooker and Chocolate Nuts Cake In Cooker recipes. Q. Can we use the Oven recipe in Microwave convection without any changes? A. Yes. We have tried and tested various temperature settings while baking in both Oven and Microwave Convection and found them to be same. So, you can use any Oven recipe straight into Microwave Convection with no changes. We can say this strongly for our own inHouseRecipes. Q. Can we use the plastic based utensils for BAKING which are given FREE with Microwave Oven purchase? A. NO. Our experience with the FREE utensils is bad. They just melted away when we tried to bake but worked fine when we used it just for heating. What this means is that the FREE ones are only good for microwave mode. They can’t be exposed to baking. You should buy Oven safe utensils for baking even in Microwave Oven. 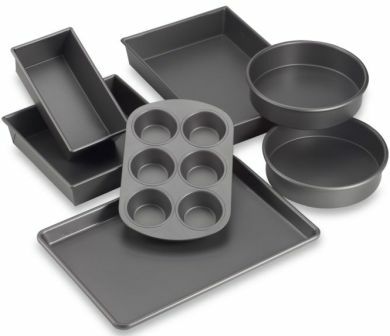 It is possible that the utensils that you received FREE with your purchase are high quality products and are Oven safe. Please check the marking on the utensil base. If it is good for Oven, you can use it for baking. In our case, the FREE ones were not Oven safe. We will keep adding and updating the Microwave convection baking questions and answers going forward in this article. So, keep checking back or ask your question in the comments. Q. How to differentiate between micro-waving (heating) and baking in microwave Oven? A. Microwave Oven have the different mode to set before you start doing anything with it. Make sure that you have set the Oven/Bake mode before starting to bake. Normally, the default mode is Microwave i.e. heating. Q. Can we grill on the glass turntable of the Microwave Convection Grill? A. Yes, you can. The only thing is that the lower portion of the food item may not grill well. So, it is obviously better to use a grill if you have it but not absolutely necessary. Have anything to add to this article? please help us in the comments section. Your suggestions/corrections and advises are most welcome.